Throughout history there have been many voyages and explorations. Some did it for adventure; some out of their plain curiosity to know more about the world they lived in; some for their own economic prosperity and in search of new markets. Some nations took voyages for conquering new lands in order to become more wealthy, prosperous and powerful. Fifty years ago, His Divine Grace A.C Bhaktivedanta Swami Srila Prabhupada boarded Jaladuta, a cargo ship, on the morning of August 13, 1965. Foru people had accompanied him to see him off from Kolkata’s Khidirpoor Dockyard. He was 70 and relatively in poor health, yet his compassion drove him to commence the journey anyway. Suffering two heart attacks during the journey, he remained confident and hopeful about his mission. Srila Prabhupada went to the West not to conquer their land or their material wealth. He went there to share the treasure of ancient India’s Vedic wisdom. Srila Prabhupada used to say that many conquerors came to India and looted much wealth, but they didn’t realize the greatest wealth India could offer – India’s spiritual knowledge and culture. Srila Prabhupada did conquer the West, though, but in a different way – not using armies and political maneuvering, but with his love and compassion. Fifty years have passed since Srila Prabhupada embarked on that difficult journey. Today Srila Prabhupada is known as one of the greatest spiritual ambassadors of India. He built a house in which the whole world can live in harmony. He has touched the lives of millions of people all over the world, either directly or through his books, temples and followers. ISKCON is now a vibrant movement with over 600 temples, farm communities and restaurants all over the world. 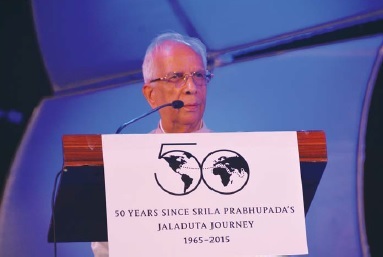 To thank this great soldier and intimate associate of Lord Sri Caitanya Mahaprabhu, and to mark this historical landmark of the Golden Jubilee of Jaladuta Yatra, devotees of ISKCON Kolkata organized several events from August 13-16, 2015. On August 13, the day when Srila Prabhupada boarded the Jaladuta, the event was held inside the Netaji Indoor Stadium, which has a seating capacity of 15,000. The morning session, from 8 am to 1 pm, was dedicated to ISKCON devotees. 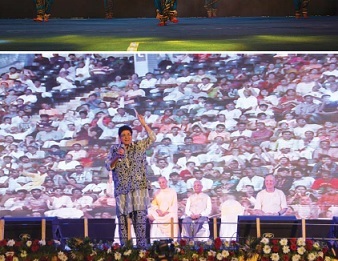 During the evening session, from 2 pm to 9 pm, several Kolkata residents participated in the festivities. Devotees from all parts of India and the world had arrived. The stadium was overcrowded, with several people standing along the stairways and walkways. Commemorating Srila Prabhupada’s achievements and to demonstrate how Krishna consciousness can unite the whole world, the flags of 125 countries were hung from the ceiling of the stadium in Kolkata. The huge stage was designed to look like the Jaladuta, with its portholes, railings, sails and even the water of the sea with blue flashing lights. The morning program also included bhajanas by the Mayapur Chandras, kirtana by Lokanatha Swami, and a tribute song for Srila Prabhupada by the young women of the Mayapur International School. A highlight was a fortyminute drama by India’s Got Talent winners Prince Dance Group on Srila Prabhupada’s life story, from childhood to his journey on the Jaladuta. West Bengal Governor Shri Keshari Nath Tripathi and politician Kiran Bedi glorified Srila Prabhupada and appreciated the activities of ISKCON. US Congresswomen Tulsi Gabbard, who is a grand-disciple of ISKCON’s founder Srila Prabhupada, sent a video message expressing her gratitude toward Srila Prabhupada. A special guest was Srila Prabhupada’s son Vrindavana Chandra De, reportedly the only person still living who came to see Srila Prabhupada off at the Khidirpoor dock. 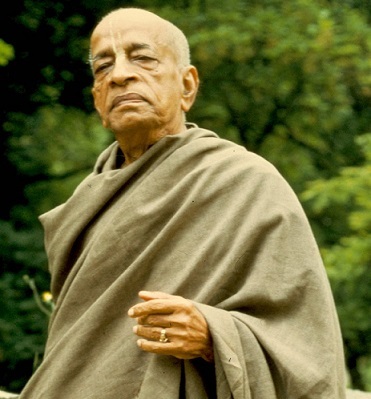 He recalled seeing his father off with a jar of coconut laddus from his sister (Prabhupada’s daughter) Bhaktilata. Prabhupada asked his son to give his best wishes to his family, and requested them to pray for his safe journey. Then, as the ship’s bell sounded its departure, Vrindavan Chandra shed tears and prostrated himself in obeisance before his father. ISKCON devotees also made another record: “Most Nationalities in a Choir”. 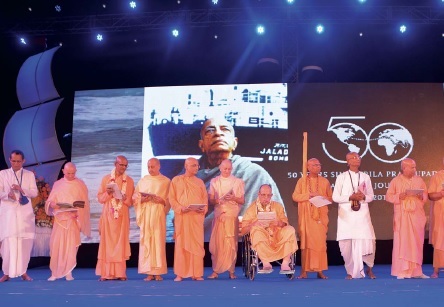 Devotees from 105 different countries sang the Bengali song “Sri Guru-carana-padma” in praise of Srila Prabhupada. A specially commissioned sculpture, designed by Russian devotee Madan Mohan Das and made by Ukrainian artist Volodymyr Zhuravel, was unveiled. Made of bronze, the exquisite piece is divided into two parts: one, depicting Srila Prabhupada boarding the Jaladuta in Kolkata, which is currently kept at the ISKCON Kolkata temple; the other shows Srila Prabhupada alighting from the ship in Boston, which will be installed in a public park near Boston Harbor. The next day, several devotees went to visit the various places in Kolkata where Srila Prabhupada performed his pastimes: his birthplace, the place where he grew up, the place where he met Srila Bhaktisiddhanta Sarasvati Thakura, etc. Finally, devotees visited Khidirpur Dock, the place where Srila Prabhupada boarded the Jaladuta fifty years ago. The devotees all bowed down and couldn’t check their emotions. On August 15, the day of India’s Independence, about 600 devotees from 125 countries, each carrying their country’s flag, performed harinama-sankirtana from ISKCON Kolkata to the Victoria Memorial. On every evening until August 16, devotees gathered at ISKCON Kolkata for cultural performances and talks on Srila Prabhupada’s life by his senior disciples. Srila Prabhupada is the greatest proponent of bhakti-yoga in the entire world. We at ISKCON know that all of us have been saved by Srila Prabhupada’s mercy. By organizing these events, we have tried our best to express our gratitude by sharing our good fortune with others. Radha Ramana Dasa is serving as the General Manager and Spokesperson for ISKCON Kolkata. He is also the liaison with the Government of India on behalf of ISKCON. He is a goldmedalist post-graduate in Mechanical engineering, and he has worked with the Russian airline company Aeroflot before he decided to join ISKCON.